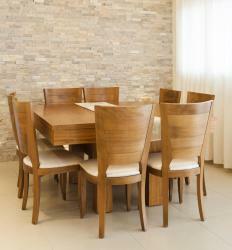 Household furniture, such as a dining room table set, is one type of durable good. The Gross Domestic Product of a nation (GDP) refers to a calculation of the total services and goods which are produced by a nation within a stated period. The relationship between consumer spending and GDP lies in the fact that consumer spending is an important component in the measurement of GDP. This is mainly due to the fact that consumer spending accounts for the major percentage of the GDP factor. This relationship can be seen in the manner in which consumer decisions regarding spending affects the total GDP calculations. When consumer spending is high, the total GDP reflects this consumer confidence through higher GDP figures establishing a direct connection between consumer spending and GDP. Consumer spending is derived by calculating how much individual households spend in the period under consideration. Such consumables include things like durable and nondurable goods. The durable goods refer to products like houses, cars and other items that generally last more than three years. Nondurable items include products like food and other perishable items that last less than three years. The total demand for such products makes a difference in the final GDP calculations. Another relationship between consumer spending and GDP can be seen in the way in which reduced consumer spending affects the calculation of the GDP. When consumer confidence is low, this is reflected in reduced spending and more saving. When consumers are more concerned with saving than spending, this leads to a shift in the balance of the economy that is reflected in reduced total GDP. Such low GDP rates may indicate to economists that the economy is in a recession. On the contrary, when the consumer spending is high, this will indicate to the economists that there is a boom in the economy. This link between consumer spending and GDP allows economists to predict when the economy has become too heated due to excessive spending. When the GDP is growing at a consistently high rate instead of maintaining a desirable balance, this may indicate to economists that the economy is growing at an unsustainable rate, which will only lead to an inevitable free fall. Unmanaged and reckless consumer spending that leads to periods of excessive growth in the GDP overheats the economy to the point that it may eventually implode. Governments usually take measures to control such unsustainable growths through various measures. One of those measures is increasing interest rates to encourage people to save money instead of borrowing from banks, so that the economy can cool down. What Is a Final Consumer? What Are the Different Methods for Measuring GDP? What Is Gross Fixed Capital Formation? What Are the Effects of Tourism on GDP? What is the difference between a consumer and consumer expense?